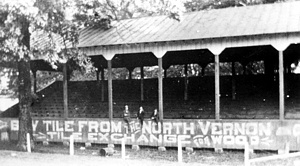 In 1882, a plot of land was purchased for fairgrounds purposes in the current location of the North Vernon City Park. For many years, this acreage was used for county fair activities such as pageants, music bands & shows, square dancing, watermelon festivals, and horse racing. In the early 1900's, a 1/4 mile oval dirt track was developed for horse racing. A huge 250' grandstand was erected at the finish line. Rumors state that the "original" grandstand was brought from Churchill Downs in Kentucky and was moved to North Vernon for the horse racing. Because of the popularity of horse racing at the time, scattered throughout the park were many horse stables which were used for sheltering hundreds of horses. In 1954, the City of North Vernon acquired the land and named it the North Vernon City Park. In 1976, the City of North Vernon decided to expand its park system. The City decided to make a 1.6 acre "mini-park", located off Walnut Street, next to the North Vernon water tower. The facility had then, and still does today, a basketball court, playground equipment, and picnic facility. Also, in 1999 John Barlow donated 8 acres of land with a small pond located next to the Jennings County Middle School to the North Vernon Parks & Recreation Department. Currently, this land is undeveloped and used as a "greenway park." In 2002, the City of North Vernon purchased three small plots of land on the northeast corner of the North Vernon City Park making the total acreage for the North Vernon City Park 29 acres. In 2005 the City of North Vernon leased 10 acres of wooded land from Midwest Gas. The area is in early development with plans to create walking trails.